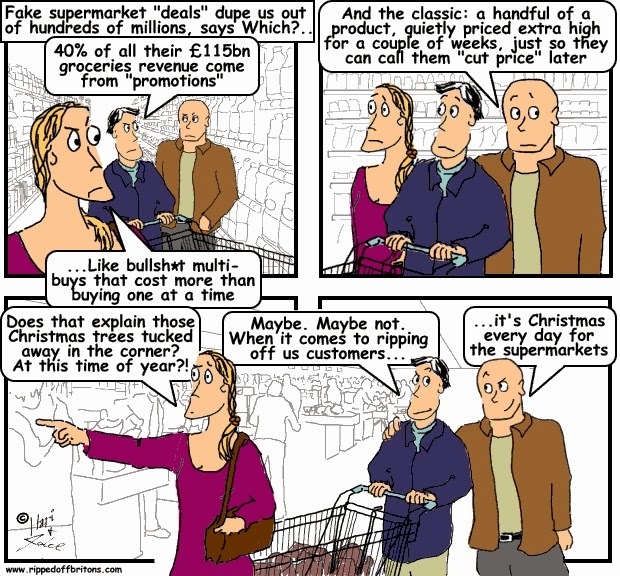 SOURCE GUARDIAN: UK supermarket “deals” dupe shoppers out of hundreds of millions, says Which? The consumer group Which? claims supermarkets are pushing illusory savings and fooling shoppers into choosing products they might not have bought if they knew the full facts. Examples raised by Which? include Tesco flagging the “special value” of a sweetcorn sixpack when a smaller pack was proportionately cheaper, and Asda raising the individual price of a product in order to make the multi-buy deal more attractive. The cumulative impact of all these different pricing tactics is that it is impossible for people to know if they are getting a fair deal, the consumer group says, particularly when prices vary frequently, consumers are in a hurry or are buying numerous low value items. About 40% of groceries in Britain are currently sold on promotion, according to the retail analysts Kantar Worldpanel. With £115bn spent on groceries and toiletries in 2013, Which? said consumers could be collectively losing out to the tune of hundreds of millions of pounds. This is the first ever super-complaint Which? has lodged against the grocery sector after compiling a dossier of “dodgy multi-buys, shrinking products and baffling sales offers” and sending it to the Competition and Markets Authority. Which? has previously made super-complaints on care homes, credit card interest rates, Northern Ireland banking, private dentistry and the Scottish legal profession. Browse all our cartoons and articles on "Retailers"